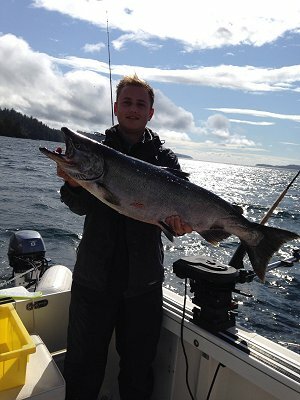 9th September, 2014: FISHING REPORT: Port Alberni Inlet, Barkley Sound, Ucluelet (West Coast), Somas-Stamp River System. We are now into the month of September and not only has there been some great salmon fishing in the Port Alberni and Pacific Rim regions but the weather is sensational with sunny skies and afternoon temperatures from seventy-five to eighty-five degrees Fahrenheit. These temperatures have made fishing in Barkley Sound and offshore areas out of Ucluelet fairly comfortable and very summerlike for those anglers seeking the big late summer Chinook and the ample Coho found in many of the great fishing spots in the area. The salmon are currently migrating to their natal rivers, streams and creeks which will create a fantastic fall fishing opportunity in the Stamp, Nahmint, and Sarita River systems. The first few weeks of September not only includes great Chinook and Coho Salmon fishing but it is also the time of the biggest salmon derby. The forty-third Port Alberni Labor Day Weekend fishing derby just wrapped up. Over two to three thousand ticket entrants participated this year with local Port Alberni angler Ray Ursel winning the derby with a thirty-seven pound Chinook which he landed using anchovy in an army truck Rhys Davis Teaser Head on the Saturday morning of the long weekend at Wittlestone which is between the Bamfield Harbor and Cape Beale. This big fish won Ursel and his group $15,000 for biggest fish of the day and also the prize money for biggest salmon of the derby. On Sunday the largest Chinook salmon was hooked by Leon Kossabar. The 25.9 pound salmon won him $5,000. Bill Goorts of Port Alberni was Monday,s big winner of $5,000 with his 34 pound Chinook. The biggest fish of each day was worth a cash prize of $5,000.00 while second place was $2,000.00 and third place winners each day won $1,000.00. The derby also awards several hidden weight awards. We are looking forward to some great salmon fishing during September. Barkley Sound and areas close to Ucluelet, China Creek (in the Alberni Inlet), and Bamfield should have some great Chinook and Coho fishing. The fishing in the Inlet for Chinook and Coho got underway about mid August. The salmon pushed into the Upper Inlet and Harbor Mouth areas quite quickly but really have not held for long periods of time. Currently there is a good push of Chinook and Coho headed for the Somass and Stamp River systems and Robertson Creek Hatchery. The best fishing is now taking place in the China Creek and McTush areas. The Chinook and Coho from the beginning of the season until this date have been hitting anchovy in a variety of Rhys Davis Teaser Heads. Army Truck, Green Haze and Purple Haze have been the best teaser heads. The 0-15 and 16 and the AORL 12 were both working well for the first ten days of the season. Currently those fisher persons using an mp 16 and also a dark green spaterback hootchie are having some success. The salmon in the first half of the morning are found in the top forty feet of water with some of the biggest Chinook that are being landed found in the top twenty-five feet. Most of the Chinook and Coho have been quite bright. 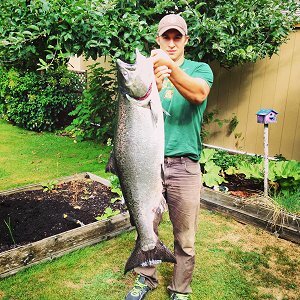 Most sport fisher persons are having the best success on Coho salmon and are having a couple of Chinook salmon hit most mornings. Every other day there seems to be a new school of salmon moving into the Alberni Inlet that are almost chrome in color. We are expecting the first half of September to continue to have some good salmon fishing. Coho are becoming quite dominant for many anglers and guide guests to land. The weather at this time of year can play a major role. If early fall rains occur the Chinook and Coho will make their way into the Somass River very quickly which will deteriorate the Port Alberni Inlet fishing. The weather for the next week is forecast as clear and sunny. Barkley Sound salmon fishing has been quite consistent over the past few weeks. Wittlestone, Cape Beale, Assets, and areas along the Bamfield Wall have been producing some great Chinook and Coho catches. The salmon are running in the top fifty feet of water and are hitting bait in a Rhys Davis Army Truck and Green Haze Teaser Head. A few hootchies, in green, mainly the spatter back and T Rex plus a few different four and five inch coyote spoons are also working. The watermelon and cop car four inch coyote has been very prominent along the Bamfield wall for Coho. Diplock and Pill Point have been off and on. The Port Alberni salmon Derby had some excellent entrants from the Pill Point area as a few Chinook over thirty pounds were weighed in from this great location. September salmon fishing in Barkley Sound can often be very good especially for big Coho that are making their way to their spawning grounds. The Coho are still actively feeding in the sound and can often be swimming in shallower water. Shortening leader lengths and trolling a little faster can result in better catches. Weather change in September can often hurry the salmon along to their natal streams and creeks. The long term forecast is looking extremely good. West Coast fishing has been a little slower over the last week. It seems some of the big Chinook that are coming to West Coast Vancouver Island areas are coming close to the beach. Some fishermen are fishing the Red Can and Lighthouse which are both close to the Ucluelet Harbor and are having some success. The big bank and Rats Nose continues to be very good for Coho and smaller Chinook. The halibut fishing has also been fairly good up to Long Beach and the inner Lighthouse.. Halibut retention is now two per day. South Bank and Long Beach over the last week have had some good fishing for Chinook in the high teens and low twenty pound range. The fish are taking spoons from the four inch coyote to spoons up to six and seven inches. White hootchies and also halloween and green spatterback are working quite well especially for Coho that are ranging from ten to sixteen pounds. It should be noted that Coho limits offshore are only at two per day and must one hatchery and one wild. Salmon fishing got underway on the 26th of August on the Stamp River. There has already been some excellent catches of bright Chinook and Coho. The salmon should begin entering the system in very high numbers beginning the week of September 8th. On the 10th of September water will be released from Elsei Lake which should really help pick the Stamp River fishing up. The peak is usually sometime during the third week of this month. 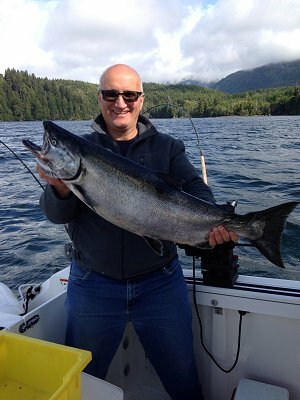 Good Chinook and Coho fishing should continue into October. 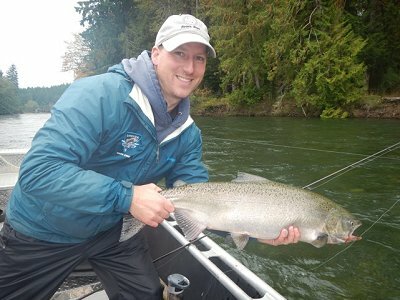 October is often an excellent month for Coho and fall or summer Steelhead. For good results anglers should use wool, spinners and spin n glows. We are expecting some great returns of Chinook and Coho and with fairly high numbers of Steelhead already in the system there should be a fantastic fall fishery in the world famous Stamp River. The best fly fishing opportunities begin around the 10th day of October.